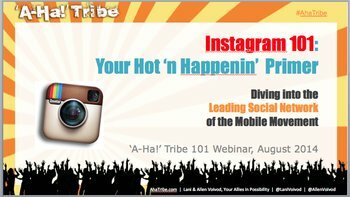 We’re looking back on the Instagram month for members of our “A-Ha!” Tribe, when we kicked things off with an intro-level webinar, Instagram 101: Your Hot ‘n Happenin’ Primer (Diving Into the Leading Social Network of the Mobile Movement). One of the things that we think is particularly powerful about Instagram is its take on hashtagging. For those who need the quick update, a hashtag – aka #, the pound sign – when attached to the front of a word, phrase, or acronym (like #AhaTribe) turns that “hashtag” into a clickable link. And when you click on it, you’ll see a list of all the other posts using that same hashtag. 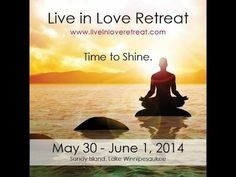 It works on Facebook, Twitter, and Pinterest as well as on Instagram. Hashtags can be added on Instagram posts in both the description of the photo or video you post, and in the comments on those posts. You’re limited to 30 hashtags per post, and as you might expect, you should only use ones that are relevant to your business and your individual posts. Because you get so many hashtags to spend, people take advantage of it, and hashtag liberally! This is good news for you, because it allows you to see how people are thinking about your business, your industry, the products and services you and your competitors deliver, and so much more. Instagram is also the new way to do keyword research! For example, if you went to Google’s Keyword Planner Tool, and looked up “Star Wars,” the phrase “Star Wars Day” would not show up. Yet on Instagram, “#starwarsday” is the #2 most popular hashtag used (after #starwars itself). 137,000 posts and counting. This screenshot from our Instagram 101 presentation elaborates a bit one on the keywords to explore. Note that the ONLY way to do keyword research on Instagram is to do it via hashtags. As with Facebook, Twitter, and Pinterest, you can make up any hashtag you like and use it at will (you don’t have to set it up or register it anywhere). Before you use a new one, however, definitely do a search on it to make sure it’s not being used, or that it’s being used the way you want it to. A personal hashtag story: Our state’s American Heart Association’s “Go Red for Women” Luncheon was happening (this was a couple years ago), and they wanted to use #GoRedNH as the hashtag. We checked it first (like we always do! ), and discovered that #GoRedNH was already being used as a rallying cry by the state’s Republican Party. (Then, as now, NH is a “blue” democratic state.) No go! So do your hashtag homework, since this is how more and more people are communicating with each other and how the gigantic masses of Instagram users are self-organizing the content they share, for your research and for the effective tagging of your own pics to get them in front of the right audiences at the right times! 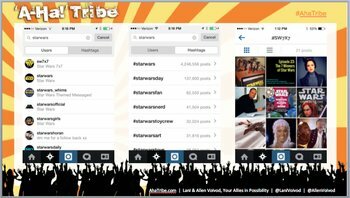 Want to get successful with Instagram? You can get access to the full 101 Webinar AND a second Instagram Webinar plus a bonus interview with Instagram expert Sue Zimmerman in our Instagram Biz Breakthrough Program. Or you can get on-demand access to more than two dozen training webinars PLUS interviews, Q&A sessions, and a fantastic private networking group in the “A-Ha!” Tribe. Either way, you’ll be taking a great step in the direction of your Instagram success!